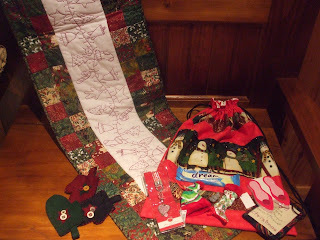 I have received my Christmas in July Swap gifts from Cherie (No Blog). 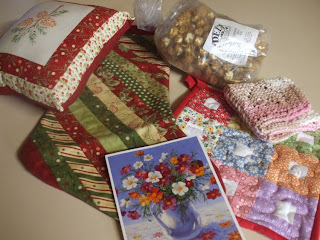 Cherie made me a lovely Xmas Stocking, a Pot Holder, a Crocheted dish towel and also sent me some caramel popcorn (YUM !) Thanks so much Cherie - It did arrive with a damaged box and a letter from Australia Post to say that they had inspected it along with Quarantine. But it arrived eventually - Thanks so much. Here are the items that I sent to my partner Michele over at Calico Daisy. 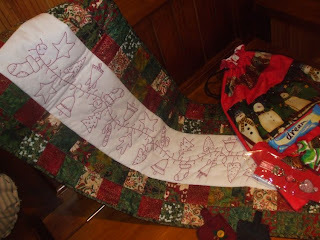 I made her a snowman drawstring bag, a table runner from a Hatched & patched pattern, lots of little mittens to hang on her tgree and a stitched ornament and a few other goodies. Thanks so much to Linda and Stephanie for organising the swap. I really enjoyed making the table runner and have cut out another to begin in the next few weeks. The weekend has been a wintery one. 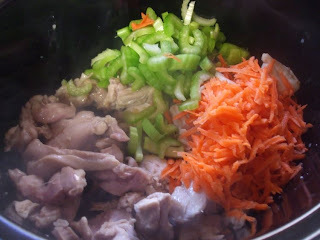 Above is the beginnings of a lovely Chicken and Vegetable soup that I made yesterday which kept away the winter chill. It has really been soup kind of weather. For those of you that are waiting on your advent information Jo and I will be matching you all up in the next day or two. I have had quite a productive day sewing today and have only just come in from the studio. Have a lovely Monday !! Lovely gifts sent and received. I know first hand how delicious the caramel corn is! It didn't last long in my house. I love handmade dishcloths. They are THE best. What is that cute little pillow with Christmas fabric? What fantastic things I have seen from this swap ! Lots of soup being cooked here too , baked tea tonight ! My son made a batch of fresh caramel popcorn the other day, and it was delicious. Gifts are wonderful-both given and received. Can't wait to find out my partner in the Advent swap. Lucky you and Lucky partner - what a gorgeous bunch of goodies. Soup is popular here too!